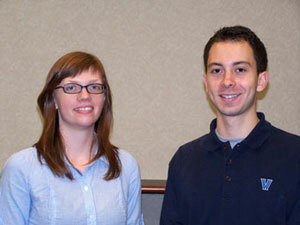 Falvey Memorial Library welcomed two new graduate assistants at the beginning of the 2010-2011 academic year: Alexandra Edwards and Jeffrey Eisenberg. The addition of a second GA to the Library’s Programming and Outreach team is the result of a continuing partnership with the graduate communication program. This year Falvey established a new graduate assistant position, partnering with the English department’s graduate program. Jeffrey Eisenberg, Villanova University class of 2010, earned his bachelor’s degree in communication with a business minor and an honors concentration. His graduate assistantship is shared between the Library and the communication department. Jeffrey is well acquainted with Falvey since he worked here during his four undergraduate years. After he earns his master’s degree, Jeffrey plans to perform public relations work for a non-profit organization or to work in corporate philanthropy. As the Library Programming and Outreach intern, his primary responsibilities are in public relations and event programming. In addition to his graduate assistantship, Jeffrey works as a resident assistant. He is a native of Livingston (N.J.). Alexandra (Alex) Edwards is a first-year graduate student in the master’s program of Villanova’s English department. Her graduate assistantship is divided between the Programming and Outreach team, for which one of her duties is working on the Community Bibliography project, and the Communication and Publications team, for which she writes and edits articles. A native of St. Augustine (Fla.), Alex graduated from Oglethorpe University in Atlanta, where she earned her bachelor’s degree in English. After receiving her master’s degree, Alex plans to pursue her doctorate and then teach English or work in a library. It’s great to have two talented people like Alex and Jeff contributing to library events and publications!